Moab is the mecca for Rock Climbing. Incredibly fun introductory areas, towers, to sheer walls with the most beautiful cracks on the planet, we have a guided tour to suit you, your group, or your family. Whether it be your first time climbing or looking to take the next step in our advanced course, our experienced guides will work with you each step of the way. Customized tours and group rates available. 25% additional charge for a chartered private tour. Our half day tour is perfect for the first time or advanced climber looking to get a taste of the incredible sandstone Moab has to offer. We will visit one of our many single pitch destinations only minutes from Moab. On this 4 hour tour, you will learn about balance, trusting your feet, belay techniques, and get in as much mileage as the time allows. Supplied: Harness, Helmet, Belay Device. Our full day rock climbing tour, is ideal for the rock climber looking to focus on technique, rope work, and getting in more mileage all while mixing the day with face and traditional crack climbing. This tour spends around 7 hours at the crag. With a private tour we can customize and focus on your needs. Are you looking to step up the game? Learn the safe and correct way with one of our professional guides. You will learn the skills necessary to lead climb, clean and top rope sport and traditional climbs. Guests will work on clipping, rope management and belay techniques while being backed up on a top rope system. Sport leading, traditional leading, anchor rigging, cleaning and evaluation, lead belaying with ATC & Gri-Gri, rope management, climbing ethics and management, multi-pitch techniques, and preparing for your first desert tower are many of the advanced courses we offer. As with all of our courses, the curriculum can be tailored to fit your needs and wants. We strive to allow ample time for practice and use the skills you will learn on any of our courses. If you love summit views as much as we do, you will really enjoy our tours to the multitude of Moab's sandstone towers. Whether it's your first Moab climbing tour, first multi-pitch, or if you're a tower aficionado, we have a desert summit in store for you, ranging in difficulty from 5.6 to 5.11. Reserve your tour and climb our introductory multi-pitch towers such as Looking Glass Rock (5.6, 3 pitches) or the multi-pitch classic corkscrew summit of Ancient Art (5.8 A0, 4 pitches). All of these towers are perfect training for the #1 tower on the planet, Castleton Tower (5.9 3-4 pitches). Climb on! Looking Glass Dome is the perfect introductory multi-pitch rock climbing route. You will learn about rope management, lead belaying, gear cleaning, climbing techniques as well as rappelling. Featured low-angle slab climbing, perfect for learning footwork, ascends three pitches to the spacious summit and jaw dropping view. After enjoying the summit, your guide will go through the safety precautions before the wild 140' rappel through the eye of an arch. This semi-detached 2-pitch tower sits, at the most, two meters from the main Mesa which it was originally attached to. A blocky start leads into a spectacular chimney full of phenomenal moves that put you in wild positions. Add this tower to your half day of climbing at the Ice Cream Parlor for the perfect full day experience. At the Fisher Towers, an ancient sea bed layer of Cutler sandstone has worn away to make some of the most intricate formations in the desert. Ancient Art sits near the base of the large towers, which loft 900' above. Still, rising almost 400' from its base to the corkscrew shaped summit, Ancient Art has one of the most gravity defying summits which will take your breath away . This stellar summit sits above the Colorado river and looks down on a 180-degree view of Big Bend. The route ascends the backside of Lighthouse Tower, not seen from River Road. Starting with great wide climbing, a stem box corner second pitch is the crux, this is a traditional route and crack climbing experience is recommended. The summit block has face climbing and a summit the size of a small card table. This climb is recommended as the next step after climbing Castleton Tower. Desert towers were made famous when Castleton Tower was published in the 50 Classic Climbs (1979). This tower is one of the most scenic and iconic monoliths in the world. Standing atop a 1,000' talus cone, Castle Rock, as the locals refer it, rises 400' to its true summit 6,657' above sea level. 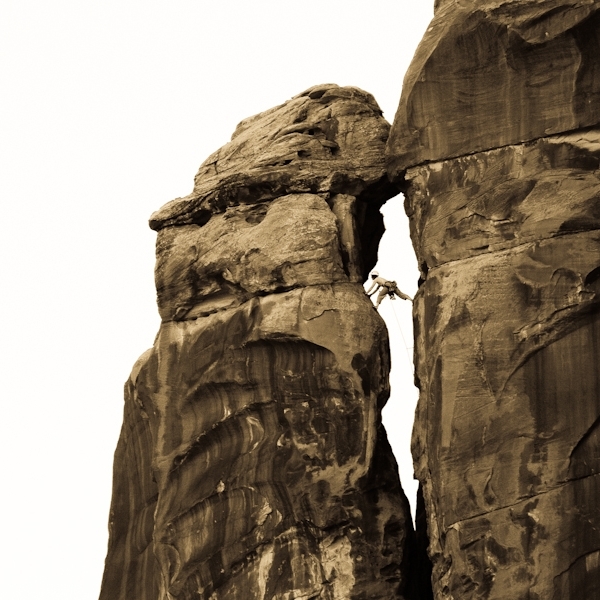 This could be the most rope lengths of any route in the Moab area. Most of the route is within the 5.7 grade due to the low angle slab climbing. Two pitches have the 5.9 grade. This fun route ascends with views of the Colorado River and another of the best summit views around. Since this is not a tower, there is a walk off to descend. Canyoneering is an adventure sport that combines multiple outdoor activities such as hiking, rappelling and sometimes boulder-hopping to descend down a canyon, formed by an ancient river. Embark on an incredible journey through an ancient petrified sand dune desert, leading you as the water has flowed for millions of years, down to the magnificent Colorado River. Starting out, you will see the La Sal Mountains towering over the desert to the East and Arches National Park on the horizon to the North. Two stunning rappels deposit you into a water-filled canyon and to the river after 4 miles of moderate hiking. Skill Level: Beginner, perfect for families and first time rappellers. When the summer heat is at its peak, being in a water-filled slot canyon (during some months) is the place to be. In Entrajo, you will wade or swim through pools of rainwater collected in potholes. A great escape for a half or full day adventure. Our Land Before Time tour will take you from the civilization of Moab and into a land like you've never imagined. An approach hike leading upward through fractured domes takes you to one of the most amazing views in the Moab area. This canyon has scrambling and boulder-hopping and we recommend you have some hiking endurance for this 6 mile day. Three rappels of epic proportions lead you through a maze of carved out canyons to the final "wind under your feet" rappel. A perfect full day introductory Canyoneering experience for those looking to traverse the desert and get off the beaten path. From the trailhead we enter a mysterious water formed canyon and approach the famed Jeep Arch and a spectacular view of our local La Sal Mountains. Dropping back into the canyon we hike through a short slot (narrow) section to the rappel point. Rappelling is another amazing way to see the desert from a different perspective. Sitting back on the rope can be intimidating, but fear not, with our systems you will be backed up on a safety line controlled by your guide. Soaring off of a natural sandstone arch or wall is thrilling. Take your Moab adventure to the next step and book a combined canyoneering and rappelling tour in the same weekend for a truly unique experience. We offer tours from beginner to advanced. Funnel Arch is a half day, 4 hour tour that has it all - majestic views, introduction to rock scrambling, and a rappel down the center of a wind sculpted arch. You will be safely roped up while on all technical sections. Join us, and feel the wind under your feet! Rappelling off of the famous arches in the Canyonlands around Moab is a unique and incredible feeling, and we can get you there. Windgate Adventures will customize a tour for your group or family, no matter if you're beginners or experts. Rappel off of arches on our guided tours to complete your Moab experience. Have you been using auto mode with your camera and looking to take the next step, or are you a skilled photographer looking to make the most of your time in Moab and capture classic scenes? Join us on one of our tours into the national parks of Arches and Canyonlands or surrounding Moab areas to thoroughly review settings of your camera(s). Learn about Aperture, ISO, Shutter Speed, Composition and Timing. Eric Odenthal, the owner and lead guide of Windgate Adventures has also been a professional photographer for more than a decade. Take adventage of this unique opportunity to experience and capture incredible moments with a professional photographer and guide in-one. Offered are sunrise and sunset tours, but if this schedule does not meet your timeframe we can build the best tour for you and your group. Please contact us at +1 (435) 260-9802 for rates. Take photography to the next level on your visit to Moab. Being in the optimal location before sunrise can be difficult in the dark. Join us for an incredible 4 hour journey to either Arches or Canyonlands and the location of your choice after discussing with us as to which is best. If you don't feel like waking up two hours before dawn for sunrise, this tour is for you. Unlike Sunrise, we will travel around the park visiting more locations until sunset. This tour will have more short hikes involved. Thank you for contacting Windgate Adventures. We will respond to your request within 24 hours.